My copy of the Bloodhound was purchased off eBay a few years back for a cheap price as it was lacking the instruction sheet and a box. The box top shown above is from the most current incarnation of the kit, released in 2008. The kit is molded in white plastic. 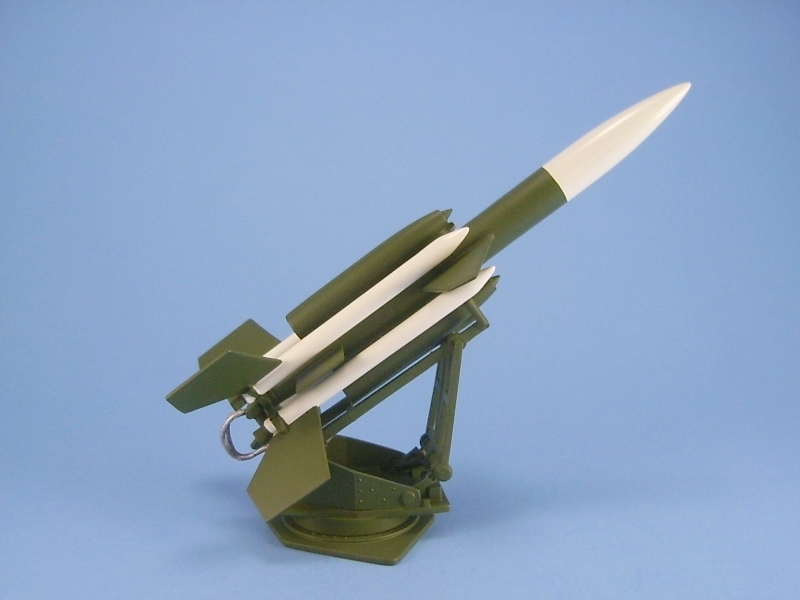 You get a missile (14 pieces), its launcher (appx. 11 pieces), a transport trailer (appx. 23 pieces), a Range Rover (13 pieces), plus five human figures and one dog. The kit does not come with decals. Though the lack of instructions did pose a few initial problems with figuring out how it all went together, but with a few reference photographs from the web, and a few test fittings later, I was ready to start construction. The molds for this kit are now close to 50 years old and they definitely show their age with a lot of the parts having mold seams and some, especially the boosters, having large amounts of flash. Detail is very limited. There are no panels lines of any sort. The Range Rover has no interior, nor is there any clear parts for the glass, while the figures are passable and the dog is excellent. I did not bother putting the Range Rover together as I had no desire to scratch build the interior or make windows. The Range Rover went into the spare parts box with the figures and the dog (though the dog was later rescued for another project). I did construct the trailer to see how it looked and how well it fit the missile, but that is as far as it went. I built the kit as sub-assemblies for ease of painting: main body of the missile, the boosters and the launcher. The plastic responded well to liquid glue and construction was quite straight forward. The majority of the work revolves around parts preparation. The modeller will need to do a lot of sanding to remove the mold seams and the seams where the parts join. I did find that my filler use was limited. Though the joins were prominent, sanding reduced them quickly and left few traces of any of the joints afterwards. The launcher can be built to be moveable but I chose to glue the launcher together in a static position, picking an angle that I thought would look interesting when the missile was added. My only modifications to the kit were the addition of small discs punched from some thin plastic sheet to cover the holes in the launcher's body where the missile supports attached. I also removed the molded on electrical conduits on the mount at the end of the launcher with some plastic coated wire sections bent to shape. I painted the Bloodhound a dark green with white nose and boosters based on a single black and white picture I found on the web. I decided to go this route for a colouring scheme because I felt the overall white scheme with the yellow boosters would only accentuate the lack of detail on the kit. Once painting was done the sub-assemblies were all glued together with super glue. The only really tricky parts came with attaching the boosters. Some care was needed to get them to sit properly and to align correctly. Since I was using super glue here I only got one chance to get it right so lots of test fits were done to check how well they would attach before actually gluing them to the missile. There is a belief that the Airfix Bloodhound is molded to 1/76 scale and until recently I also believed that was the case. This all changed when fellow modeller Rob de Bie emailed me this thread entry he found on the Airfix Forum which points out that the Bloodhound is actually 1/72 scale. 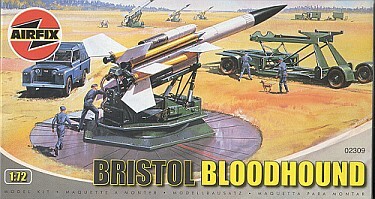 "Airfix's first military vehicle kit, the Bristol Bloodhound was also released in 1960 and was in 1/72 scale. The Type 2 bag this was first released in even had 1/72 scale on it. Measurements of the model also indicate that it is 1/72 scale. However, the next year, so as to be in scale with their figures, Airfix changed the scale of their military vehicles from 1/72 to 1/76. Airfix incorrectly relabelled the scale of the Bloodhound 1/76. Ironically, when Hornby corrected the scales for the Airfix military vehicles, they incorrectly labelled the Bloodhound as 1/76, when it should have stayed at 1/72." Based on this post in the Airfix forum and using measurements for the Bloodhound Mk.I obtained from the December 6, 1957 issue of Flight magazine found on the web, I decided to measure my Bloodhound using a set of dial calipers. The table below illustrates my findings. As you can see, measurements of the built kit show that the missile is extremely close to 1/72 scale and is definitely not a 1/76 scale kit as has been reported previously, and confirms the statements made about the Bloodhound in the Airfix post. I can not vouch for the scale of the trailer or Range Rover though. I would assume that the trailer is close to 1/72 scale as well since it is designed to fit the missile. So what you get with the Airfix Bloodhound is a not bad representation of the missile and launcher, while the transport trailer and Range Rover are not so good. The age of the kit definitely shows though and it would be great if Airfix , or some other manufacturer, would come out with a state of the art molding of this important Cold War SAM.